by Alan D. Morrison, William J. Wilhelm Jr.
Investment Banking: Institutions, Politics, and Law provides an economic rationale for the dominant role of investment banks in the capital markets, and uses it to explain both the historical evolution of the investment banking industry and also recent changes to its organization. Although investment decisions rely upon price-relevant information, it is impossible to establish property rights over it and hence it is very hard to coordinate its exchange. 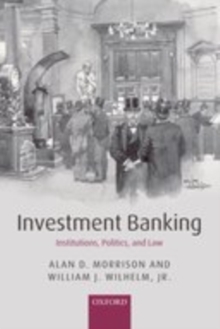 Theauthors argue that investment banks help to resolve this problem by managing "information marketplaces," within which extra-legal institutions support the production and dissemination of information that is important to investors. Reputations and relationships are more important in fulfilling this role thanfinancial capital. The authors substantiate their theory with reference to the industry's evolution during the last three centuries. They show how investment banking networks were formed, and identify the informal contracts that they supported. This historical development points to tensions between the relational contracting of investment banks and the regulatory impulses of the State, thus providing some explanation for the periodic large-scale State intervention in the operation of capital markets. Theirtheory also provides a technological explanation for the massive restructuring of the capital markets in recent decades, which the authors argue can be used to think about the likely future direction of the investment banking industry.